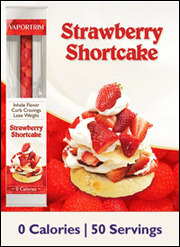 Breakfast Goodies, Fun New Foods, Inhalable Desserts & More! Quaker Whole Hearts Original Cereal - Get that oaty Quaker nutrition you love plus a slightly sweet toasty flavor in a bowl of crispy heart-shaped b-fast bits! This cereal is also a good source of vitamin D. Each 3/4-cup serving has 110 calories, 1.5g fat, 160mg sodium, 23g carbs, 3g fiber, 6g sugars, and 2g protein (PointsPlus® value 3*). Look for it the next time you're in the cereal aisle! Jimmy Dean Delights Turkey Sausage Quesadilla - Frozen breakfasts don't need to be boring. Exhibit A: this ready-to-nuke morning quesadilla. Jimmy and his pals stuffed their tortillas with egg whites, cheese, and tasty turkey sausage -- smart! One quesadilla (half the box) has 250 calories, 10g fat, 510mg sodium, 24g carbs, 1g fiber, 2g sugars, and 15g protein (PointsPlus® value 6*). 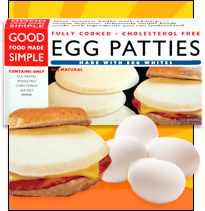 Scope out your local freezer aisle for these babies -- click to locate. As Chewed At Expo West... Coming to a Store Near You! Our pals at Cedarlane are making their mark in the light-meal market with their new CedarLean line. The most impressive items? Wrap 'n soup combos with less than 250 calories per duo. HOW COOL IS THAT? And Amy's Light & Lean frozen lineup is getting a couple of new additions -- pizzas! These are square-shaped, single-serving pizzas that come in two varieties: Italian Vegetable (with spinach, artichoke hearts, and mushrooms) and Cheese. A whole pizza has only 270 - 280 calories and 6g fat (PointsPlus® value 6 - 7*). These should be in most stores by May or June. From another company we love, Luna Fiber bars are on the way! The texture reminds us of Nutri-Grain bars, the taste is REALLY good, and each bar packs a whopping 7g fiber! Flavors include Vanilla Blueberry, Peanut Butter Strawberry, and Chocolate Raspberry. For 110 - 120 calories per bar (PointsPlus® value 3*), these are ideal for nibbling with a cup of coffee. In the salty snack arena, we discovered Michael Season's Popped Black Bean Crisps. These chips are totally unique and delicious. Chomp on a 1-oz. serving (about 17 pieces) for 120 calories and 4g fat (PointsPlus® value 3*). Multi-serving bags are already available; we're told single-serving packs are coming soon! 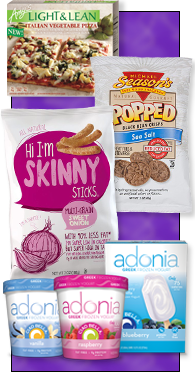 And the super-new Hi I'm Skinny Sticks caught our attention -- first with the name, and then with the taste! These are all-natural, whole-grain items with 120 - 130 calories and 6 - 7g fat (PointsPlus® value 3 - 4*) per 1-oz. serving (about 34 sticks). They're set to hit stores soon, so consider this a heads-up. And finally, to cool it all down, Ciao Bella (maker of tasty gelato) has launched Adonia Greek Frozen Yogurt. This fat-free stuff comes in a slew of scoopable flavors (1/2 cup = 130 calories and a PointsPlus® value of 3*) as well as Peach and Wild Blueberry 75-calorie bars (PointsPlus® value 2*). Find them in stores now. Get excited (and hungry)! Take Care of Your Brain and It'll Take Care of You! What we put into our bodies can mess with our heads. Overeating tends to physically slow us down, of course, and new research shows that consuming more than 2,100 calories a day can DOUBLE the risk of memory loss among those in their 70s and 80s. Results of another study suggest that a high-fat diet could actually cause lasting damage to a part of the brain that's crucial for weight control. So do your brain and your body a favor, and set good habits now. 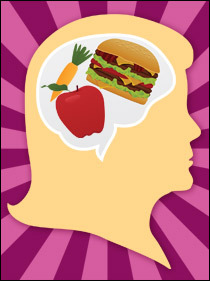 On the flip side, our minds play a big part in what we eat. When it comes to selecting which foods to buy, one study found that claims made on packaging could influence our perception of how those products will taste. Specifically, those who knew the cookies they were eating were sugar-free found the cookies to be less appealing than those who didn't have any information. Crazy! And when you're feeling hungry, doesn't it seem like everything associated with food grabs your attention? In a newly published study, both food-related words and neutral words were quickly flashed in front of subjects; hungry participants identified the food-centric words more often and more clearly than those who had just eaten. Fascinating stuff, people. Think before you chew, but don't overthink it! Remember Le Whif, the inhalable chocolate? That same concept has been applied to other sweet treats by a company called Vaportrim. Unappealing name aside, the breathable "dessert" product claims to curb cravings; it comes in flavors like Strawberry Shortcake, Maple Pancakes, and Peach Cobbler. Do you think this would work for you... or just make you hungrier? ***If you frequent the Olive Garden, check this out -- the chain has got a new limited-time $6.95 "Create Your Own Lunch" promo that pairs soup or salad with a calzone or half-sized selection. But be careful and choose wisely. A bowl of Minestrone with a half of a Grilled Chicken Caprese Panini has only 380 calories and 12.5g fat, but the seemingly smart Garden Fresh Salad paired with half of a Grilled Chicken Flatbread equals 670 calories and 42g fat! Do your research and order safely. And don't overdo it with those breadsticks! ***Need another reason to eat your fruits and veggies? Do it for beauty! A new study shows that eating more produce can give your skin an attractive glow in just weeks. Especially effective are foods rich in carotenoids -- so chomp on carrots, mango, and squash, and start feeling pretty! ***Speaking of pretty people, make sure to tune in to The Dr. Oz Show TODAY (Monday, 3/19). Three gorgeous ladies who lost a total of OVER 300 POUNDS eating Hungry Girl recipes will be chatting with Lisa (a.k.a. HG) and Dr. Oz! Lisa will also whip up some goodies in the kitchen, so click for show times, and check it out! And that's all we've got. HG out! Pass the scoop on all the latest foods to your chums -- click "Send to a Friend" NOW! Happy National Poultry Day, March 19th! We think we'll celebrate by turning a chicken breast into PIZZA -- this recipe is so fun.